I must confess that I now have the bug to finish climbing the 46 Adirondack High Peaks this year. I really wasn't feeling the urge earlier in the year, but now that I am 2/3 done (32/46) I will probably push to finish. I will, however, wait for the right weather. I want to be able to enjoy the summits and get the views, and not just check off a summit. 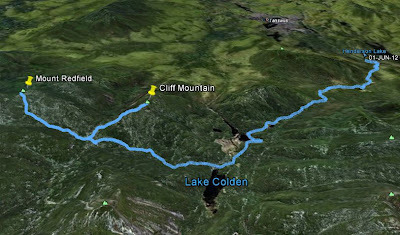 Yesterday, my choice for a hike was Cliff Mountain and Mount Redfield. Rev and I were gearing up for a big day on Friday. Scatterbone also needed these peaks and joined us for the hike. We met at the Upper Works trailhead at 6:30 AM and were quickly on the trail. The weather forecast was generally good for the morning, with increasing cloudiness for the afternoon and a 30 % chance of showers late in the day. It was cool, with temps in the low 40's in the morning and upper 60's in the afternoon. Looking towards Avalanche Pass and Mount Colden from the Colden Lake bridge. We quickly made the 4.5 mile hike on the Calamity Brook Trail to the Calamity Lean-to in just over 2 hours. We continued around Flowed Lands and crossed the Lake Colden bridge en route to the Uphill Brook Lean-to. To my surprise, Rev was able to go up and down the 12 step ladder! Hurrah! After you cross Lake Colden and head up towards the Uphill Brook Lean-to, the waterfalls and pools are fantastic! If you are going by there in the warm summer months, don't forget to have some swimming clothes. The Uphill Lean-to location was nothing special, but it provided us a place to sit and have some water and a snack. We had reached this Lean-to in 3 hours from Upper Works. Near the lean-to was the small cairn marking the herd paths to Cliff and Redfield. After 5 minute or so, we came to the split in the herd path. We decided to do Redfield first, since it has the better views. We didn't want to miss it, in case the weather went south. We descended Redfield and then took the other branch of the herd path fork towards Cliff Mountain. Cliff is only .8 miles from the fork but it was tough! Right away we were in lots of mud. After the mud were muddy cliffs. After the muddy cliffs were cliffy cliffs (do you get the idea?). I had to help the dog twice, and she is a pretty nimble dog. We made the summit of Cliff at 1:50 PM, after expending a lot of energy. It's not a summit I'll return to time after time. Cliff does have some views to the north and south, but not as good as Redfield. On Cliff the weather was beginning to look a little questionable, so we made tracks to head back. Doesn't that look refreshing for July and August? Once we got back on the marked trails, we had no worries if it stared to rain. We did get some sprinkles from the Calamity Brook Lean-to on out, but they were hardly noticeable. We made is back to the car at 6:30 PM, so a 12 hour trek, including stoppage time. It recorded the distance as 18.0 miles. Thanks Scatterbone for the company. While driving out in Tahawus, I saw 2 beavers playing in a pond. I stopped to grab a couple picture. You beat me to it! Nice post and pics, thanks again for a nice hike, you and Rev were great companions. Until next time...happy hiking! Great fun. Thanks for joining me. So now you know why they call Cliff "the Great Adirondack Vertical Swamp." If you do decide to re-climb it some time, there's a slide that makes for a pretty cool route. Glad you liked Redfield, I finished my 46 on that peak. 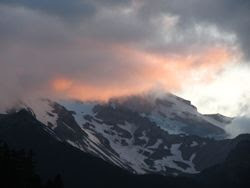 My wife Beth has 4 peaks to go, including Redfield. Who knows, it may be her 46th too. Somehow I suspect you'll finish the 46 this year. You've really been ticking them off. Great info. Looking to hike Cliff, Redfield camp and go get Skylight and Gray this week. Weather could make it iffy. Thanks! Hope you made it. The weather turned out to be OK where I was. Do you recall are the herdpaths fairly easy to follow, and how are the cliffs on Cliff? I ask because was thinking of doing with my two kids and I (ages 9/12 they are strong hikers and have done many high peaks to date), but we need these two! Hi Rebecca. Yes, they are easy to follow. There is one herd path that splits in two after a short ways (L for Redfield, R for Cliff). I think the kids can handle the cliffs. The distance may be more of a factor if you do it as a day hike. Yes, I went from Upper Works. There is no primary route. The distance and time are about the same. 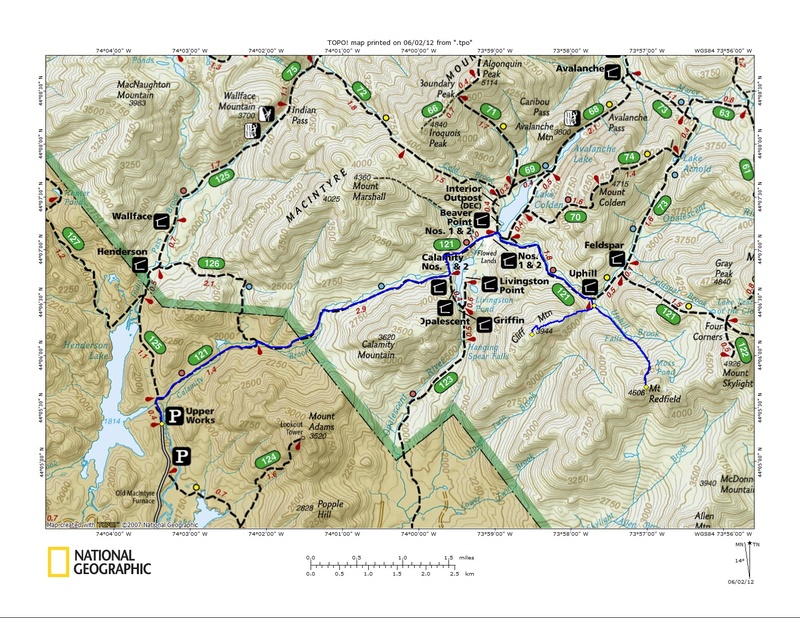 The Loj is a more well known trailhead, and has more parking, so it gets more use. If your dog is somewhat agile, you should have no problem. There is one spot on Cliff that is tough, but my dog managed without issue. I am trying to do all of the peaks with my Husky, Jack. I love this blog because it gives a lot of insight that the books don't. Are there any peaks that you were unable to take your dog? I'm nervous about Saddleback and Armstrong - should I be? Thank you for your help!! 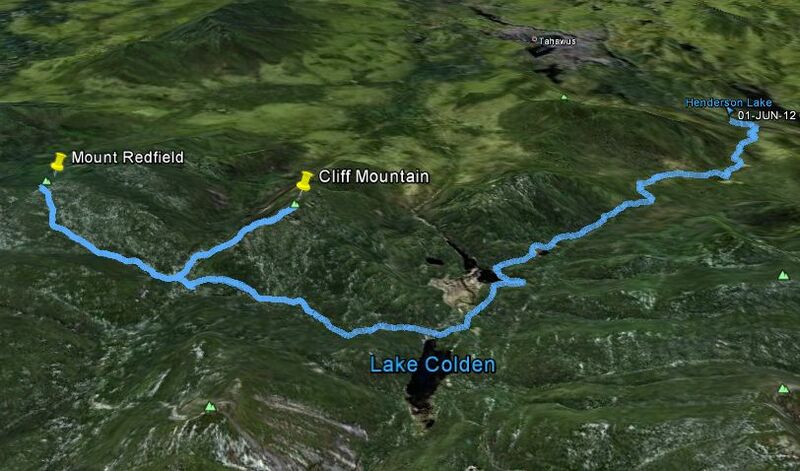 You can climb Saddleback from the Gothics side via the Orebed trail with the dog. I wouldn't take a dog up the Saddleback cliffs from the Basin side. Armstrong isn't bad but there is a ladder to negotiate or find a work around. My dog has done all 46 Peaks. The only issue is that dogs cannot go onto AMR property, so that required a longer approach to some mountains. Love your blog, man. I hike with a dog (Abbey the yellow lab, 26 of the 46 and counting) and it's great to get information about what to expect. BTW, what GPS app do you use to make those cool maps? Any GPS can record a track. 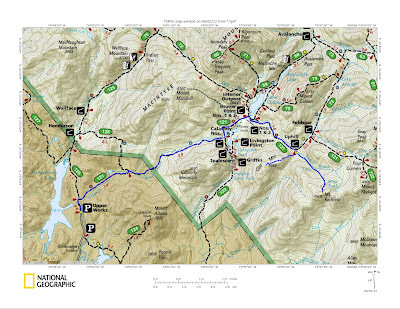 I import the track into Caltopo to create maps. Thanks for reading and good luck on your dog hikes!